LOS ANGELES (AP) — A holocaust swept out of the mountains fringing the famed San Fernando Valley Tuesday. Oil tanks exploded in the path of twin fires. Eight hundred patients fled a sanitarium. 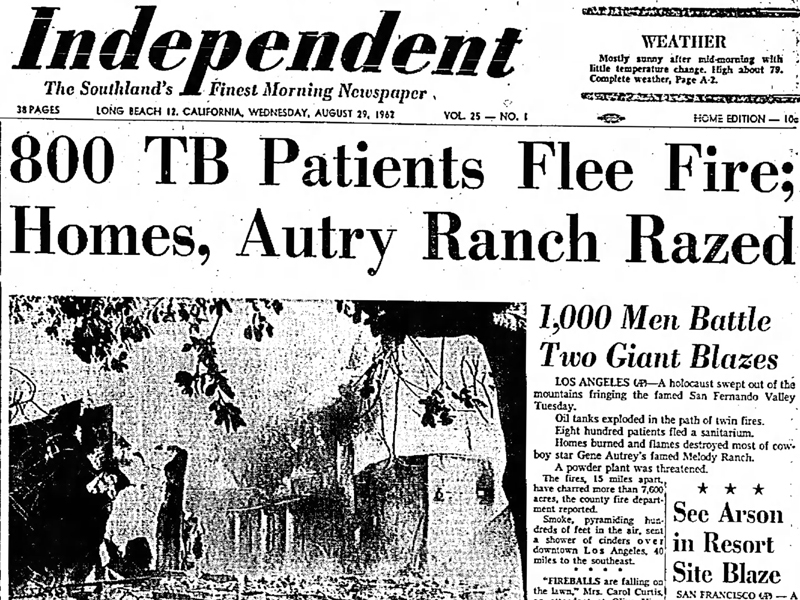 Homes burned and flames destroyed most of cowboy star Gene Autrey's [sic] famed Melody Ranch. A powder plant was threatened. The fires, 15 miles apart, have charred more than 7,600 acres, the county fire department reported. Smoke, pyramiding hundreds of feet in the air, sent a shower of cinders over downtown Los Angeles, 40 miles to the southeast. 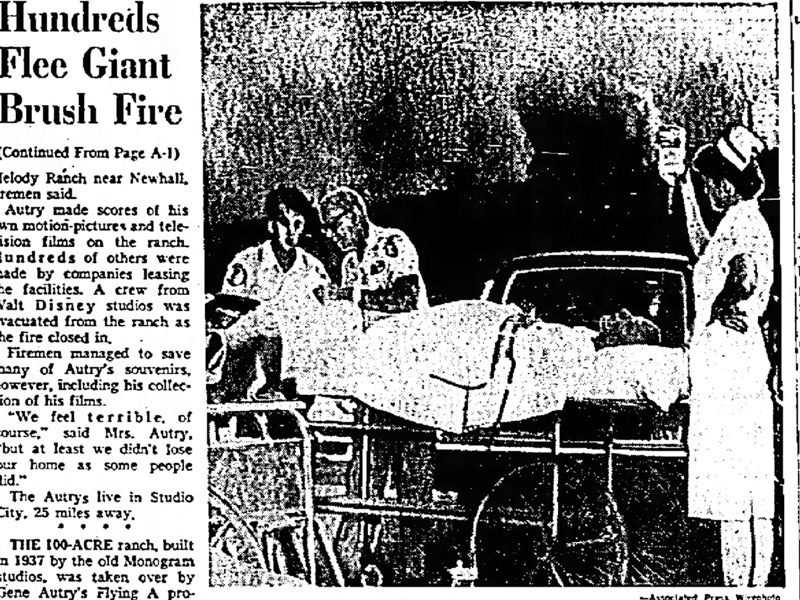 "Fireballs are falling on the lawn," Mrs. Carol Curtis, an attendant at Olive View Sanatorium, told the Associated Press as a fleet of ambulances, buses and cars evacuated all patients. "The infirmary-surgery building is gone and two garages," she said. "Some of the trees right here in front of the administration building caught fire and someone had to put them out with a garden hose." 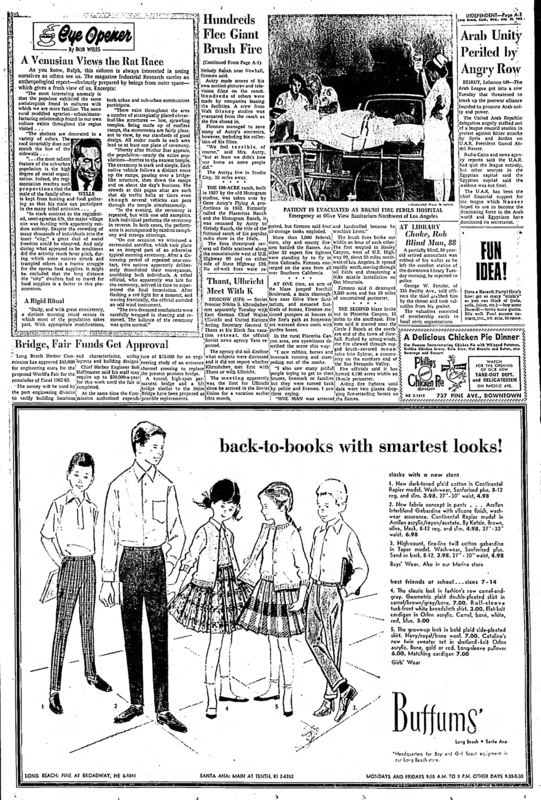 Olive View for many years has been Los Angeles County's principal tuberculosis sanitarium. Another fleet of 10 buses was standing by at a Veterans Administration tuberculosis hospital two miles to the east of Olive View in case it became necessary to evacuate the patients. The fire already has destroyed three homes and 12 other structures as well as four oil-storage tanks, the county fire department reported. Firemen massed men and equipment around the Bermite Powder Co., an explosives manufacturing plant in nearby Soledad Canyon. Scores of residents were evacuated from Placerita Canyon, a rural area of ranches where one of the fires began. Others were ordered to leave their weekend cottages in Val Verde Park near Castaic, 10 miles to the north, in the path of the second blaze. The Red Cross set up an emergency reception center in Newhall, midway between the two blazes. Some of the Olive View patients were evacuated from surgery, still unconscious, with bottles of blood plasma suspended above their stretchers. Firemen estimated the sanitarium damage was at least $100,000. The county facility is in suburban Sylmar. 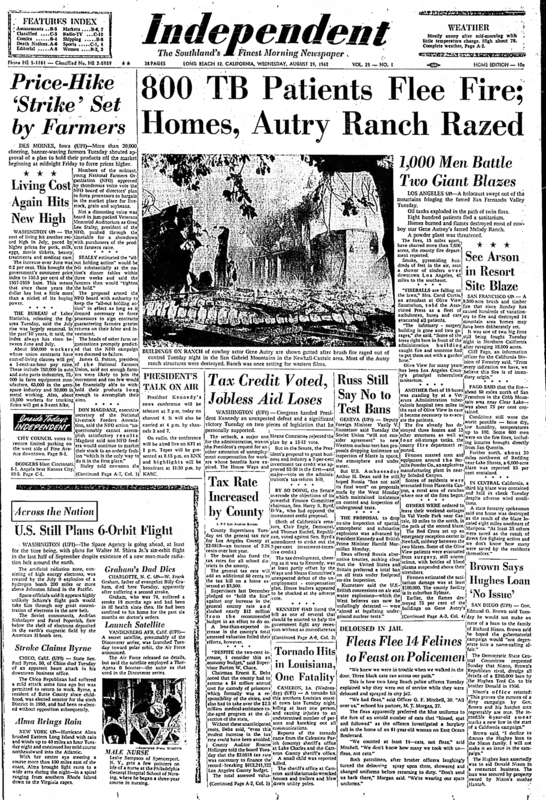 Earlier, the flames destroyed 75 per cent of the buildings on Gene Autry's Melody Ranch near Newhall, firemen said. Autry made scores of his own motion pictures and television films on the ranch. Hundreds of others were made by companies leasing the facilities. A crew from Walt Disney studios was evacuated from the ranch as the fire closed in. Firemen managed to save many of Autry's souvenirs, however, including his collection of his films. "We feel terrible, of course," said Mrs. Autry, "but at least we didn't lose our home as some people did." The Autrys live in Studio City, 25 miles away. The 100-acre ranch, built in 1937 by the old Monogram studios, was taken over by Gene Autry's Flying A productions in 1952. Formerly called the Placeritas Ranch, it was renamed by Autry to Melody Ranch, the title of the fictional ranch of his popular radio show in the 1940s. The fires threatened several oil fields scattered along the mountainside west of U.S. Highway 99 and on either side of State Highway 126. No oil-well fires were reported, but firemen said four oil-storage tanks exploded. More than 1,000 federal, state, city and county firemen battled the flames. Another 32 expert fire fighters were standing by to fly in from Colorado. Firemen converged on the area from all over Southern California. At one time, an arm of the blaze jumped Foothill Boulevard, a main thoroughfare near Olive View Sanitarium, and menaced hundreds of homes. Firemen stationed pumpers at houses in the fire's path as homeowners watered down roofs with garden hoses. "I saw rabbits, horses and livestock running and stampeding out of the smoke. "I also saw many pitiful people trying to get to their houses, livestock or families but they were turned back by police and firemen. I saw them crying. "One man was arrested and handcuffed because he wouldn't listen." The brush fires broke out within an hour of each other. The first erupted in Hasley Canyon, west of U.S. Highway 99, about 55 miles northwest of Los Angeles. It spread rapidly south, moving through oil fields and threatening a Nike missile installation on Oat Mountain. Firemen said it destroyed 3,500 acres and has 10 miles of uncontained perimeter. The second blaze broke out in Placerita Canyon, 15 miles to the southeast. Firemen said it started near the Circle J Ranch at the northern end of the town of Newhall. Pushed by strong winds, the fire chewed through rugged brush-covered moumtains into Sylmar, a community on the northern end of the San Fernando Valley. Fire officials said it has burned 4,100 acres within an 18-mile perimeter. Aiding fire fighters until dark were two planes dropping fire-retarding borate on the flames.